I love hot cross buns! They are my favorite! 2. 我的麵糰在第一次發酵時, 發酵1小時也大不了很多, 我不敢發太久, 便整形, 整形後, 又發酵1小時, 同樣祇大小小, 但我在最後一次做麵包時, 依你的食譜內的yeast份量多加了1/4 茶匙, 仍然是發不起似的, 如果在上述兩次的發酵過程中, 是否發酵不夠時, 體積小, 便要延長時問? 正常可以延長多久時間而不過度呢? 我的象印麵包機只可焗一磅的麵包, 不知以上材料是否會過多, 請問你的麵包機容量是多少? 我未曾試過用湯種做麵包, 希望體驗一吓, thx. hi Christine, I can't agree more with you... Easter day is to remind us why Jesus died for us.. yet, the Easter day celebration in M'sia is nothing more than a normal Sunday. Christine你好呀! 我今天剛做了你食譜裡的十字包, 但唔知點解麵包機攪完材料發酵後, D提子全部都係底部...焗完出黎味道及鬆軟都不錯, 就是外觀不好看! i dont have bread machine.. can i make this as well? and how? Thanks for posting all the information for us. I am living in U.S.A. It is very helpful and I just bake hot dog buns for my American co-workers, they loved them. May I know how can I bake with wheat floor instead of white bread flour? Think that you can try using wheat flour. Unfortunately, I haven't experimented, so can't tell how many of wheat flour to incorporate exactly. 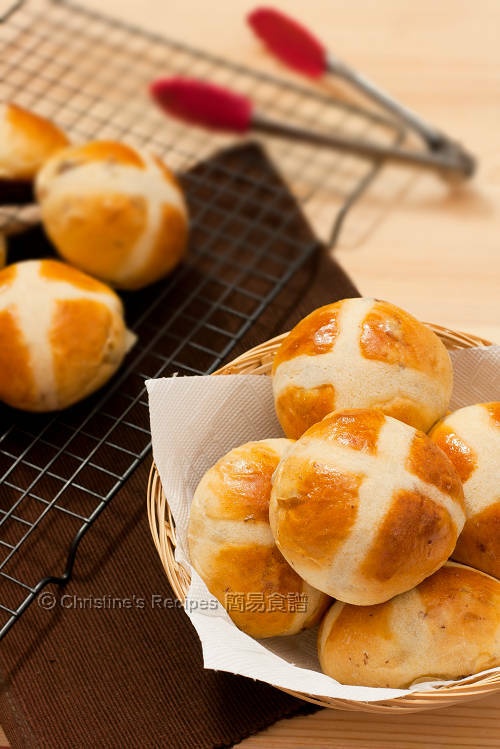 Hi Christine, I have tried this raisin buns, but instead of using plain flour, I made custard to pipe on the bun :p the buns turned out very soft and nice. But on the 2nd day, the buns became very chewy after I reheat it. any idea why? Thanks... I love your recipes! This is Hong Kong Headline Daily reporter Charis Tam. Yesterday I've sent you an email, did you received that? 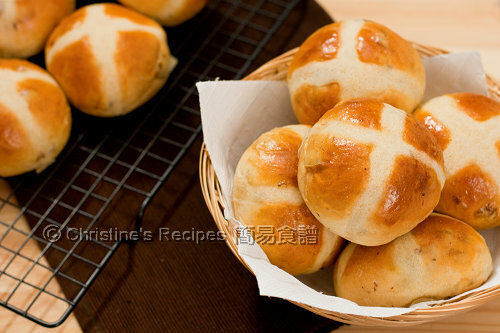 I'm sincerely invite you to present your "Hot Cross Raisin Buns" in our coming Easter Supplement, are you interest on it? Did you mean to republish this recipe on your site? Sorry, I don't post duplicate contents anywhere on internet. I only keep the unique content on this blog. Thank you very much for all your sharing about baking, cooking, I followed your recipe to bake the buns almost every week now. 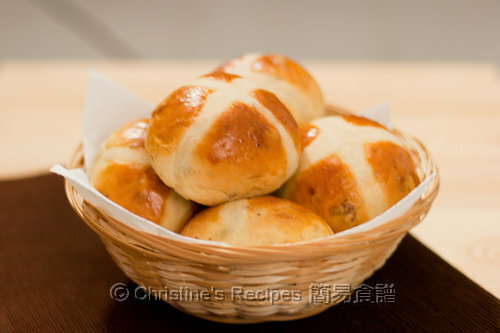 I want to try this Hot Cross Bun, wonder why do you use the "basic" setting instead of the usual one "dough" setting? Is there any difference? Or if I can keep using the dough setting? For my bread machine, the basic setting is for kneading dough. Please refer to your own machine manual, and follow the instructions to knead your dough. Can you please advise approximately how many buns this recipe makes? Thank you!